SAN JOSE, Calif.--(BUSINESS WIRE)--ThreatMetrix®, a LexisNexis® Risk Solutions Company, today released new cybercrime insights from the first half of 2018, revealing a sharp rise in fraud attack levels on mobile transactions. As consumer behavior increasingly embraces mobile for virtually all online goods and services, fraudsters are starting to close the gap on this channel. These latest findings are based on the analysis of 17.6 billion digital transactions on the ThreatMetrix® Digital Identity Network® during the first half of 2018. The network also detected and stopped 361 million cybercrime attacks in the same period. Mobile offers organizations unique opportunities for accurately assessing user identity, thanks to highly personalized device attributes, geo-location and behavioral analysis. It offers strong customer authentication options that require no user intervention, including cryptographically binding devices for persistent authentication (“Strong ID”). The number of Strong IDs for mobile devices on the ThreatMetrix network has more than doubled in the first half of 2018, improving both customer recognition rates and the efficacy of identifying trusted transactions. Mule networks also continue to negatively impact the global banking ecosystem, particularly as financial crime becomes an ever-more sophisticated and hyper-connected beast. The challenge for financial institutions is detecting mule activity even when individual account behavior may not trigger red flags. ThreatMetrix is able to harness the power of its global Digital Identity Network to help identify and block potential mule networks before transactions are processed. The ThreatMetrix Digital Identity Network analyzed 8.3 billion transactions in Q2 2018 and stopped 151 million cybercrime attacks in real time. 54% of all eCommerce transactions are now cross-border, which is much higher than other markets, and emphasizes the industry’s increasingly global footprint. Cross border eCommerce transactions are 69% more likely to be rejected as fraudulent, however, demonstrating the challenge of accepting overseas commerce. 25% of new eCommerce account applications are fraudulent, a 130% increase compared to Q2 2017. 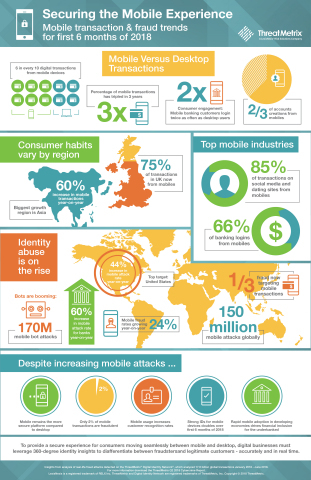 Attacks on financial services’ mobile transactions increased 33% year-over-year. China appears on the top five cybercrime attackers list for the first time ever. Access the Cybercrime Report: Q2 2018 here. ThreatMetrix®, a LexisNexis® Risk Solutions Company, today released new cybercrime insights from the first half of 2018.